At 139km and approximately, 2.5 hours journey time away, Geneva isn’t the closest airport to the ski resort of Meribel – that honour goes to Chambery. However, Geneva’s size and timetable of cheap airlines flying regular routes from all over Europe means that the connection from Geneva airport to Meribel ski resort is the busiest during the winter months. As one of the most popular French ski resorts, especially with British tourists, Meribel has been attracting thousands of skiers and snowboarders each week of the winter season for over 80 years. 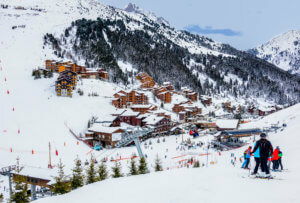 There are plenty of slopes immediately surrounding the resort which will keep all abilities busy – but one of the biggest draws to Meribel is its location at the heart of the huge Three Valleys ski area. Geographically, Meribel sits at the beginning of the large Tarentaise Valley. This area is home to some of the most famous French resorts such as Courchevel, Val d’Isere and Val Thorens – and provides some of the best skiing in the world. Regrettably, the transfer times here are slightly longer than in other areas. Meribel’s location actually has the shortest transfer time (and cheapest transfer costs) of all the resorts in this world famous area. The vast majority of commercial flight from Europe land on the Swiss side of Geneva airport. From here it is a short hop on to the highway which takes you straight in to France and on to Meribel ski resort. There are two potential routes for Geneva to Meribel ski transfers to take. The most popular one takes you around the beautiful Annecy lake on smaller roads. This route is the most direct at 139km and has less tolls to pay, but can be slightly longer time-wise if there is congestion. The second transfer route takes passengers past Chambery and around the Massif des Bauges natural wildlife park on fast highway roads. The mileage is slightly higher on this route at 184km but the fact that you are travelling on fast toll roads means there is less likelihood of delay due to traffic at busy times of day. If you’re lucky enough to be travelling to Meribel with a group of friends or family then a private transfer provides the quickest and most convenient method of transport. Your driver will meet you straight from your flight and take you directly to your hotel or chalet door in Meribel with zero hassle. Private transfers can be on the expensive side, but by pre-booking using Snowcompare.com you can be sure that you get the best deal available. A one-way private transfer between Geneva airport and Meribel can be as little as £28 per person using Snowcompare if you have the optimum number of passengers. Most private transfers work in vehicles with eight seats – so the most cost effective way to book is to split the cost between a group of eight people. There are some very competitive prices out there from reliable companies, but the main advantage is the convenience of being collected in Geneva airport no matter what your flight time is. For smaller groups a private transfer may work out a little on the expensive side (keep in mind that you are effectively paying for a 2.5 hour taxi journey for up to eight people). In these instances the next best option is definitely a shared transfer by coach or bus. Leaving from Geneva airport at set times, shared journeys are amongst the cheapest transfer options to and from Meribel. Snowcompare.com partners provide shared transfers between Geneva and Meribel for as low as £52 per person. The main advantage of shared transfers is that you only have to pay for your own seat – rather than covering the costs of the whole vehicle, so for individuals, couples and small group the cost is considerably less. If you are considering getting a shared bus transfer to Meribel it is always best to check the timings before booking your flights. Snowcompare works with the best local shared transfer providers so our customers can see exactly what is available between Geneva airport and Meribel. Another transport option available from Geneva airport is the train. The train station is connected to the airport via a short-ish walk, and trains run regularly all around France, Switzerland and Europe. Getting to Meribel ski resort by train will involve taking the train from the airport to Chambery, then changing to another train going to Moutiers. From the valley town of Moutiers it is still necessary to take a bus or taxi the remainder of the way up the mountain to Meribel. Trains can be an effective way of travelling – but for ski holidays there can be a lot of changes and waiting times involved when you just want to be on the slopes. The cost versus a shared coach transfer are negligible as well, considering the changeovers required. For those considering driving on to Meribel, Geneva airport offers the normal range of car hire places that you would expect from a large international airport. Their desks are a short walk from the arrivals hall, and the vehicle pick-up is a short bus journey from these desks. Hiring a car to get to Meribel can certainly be convenient and give you added flexibility in terms of flight times. Just keep in mind that parking in Meribel resort is limited and will almost certainly require payment. Driving in snowy mountain conditions can also be challenging for those not used to it, and if it does snow on your journey you may have to tackle putting on the dreaded snow chains. Snowcompare.com allows you to easily search, compare & book the best private and shared transfers between Geneva airport and Meribel ski resort. Quickly and easily find the available transfer options, read customer reviews and see honest prices all on one page. 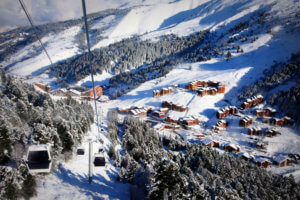 The cheapest and best ski transfers for Meribel are all available on Snowcompare.com.